Text: From the Hours of the Virgin at Matins (the Hymn of Sts. Ambrose and Augustine). 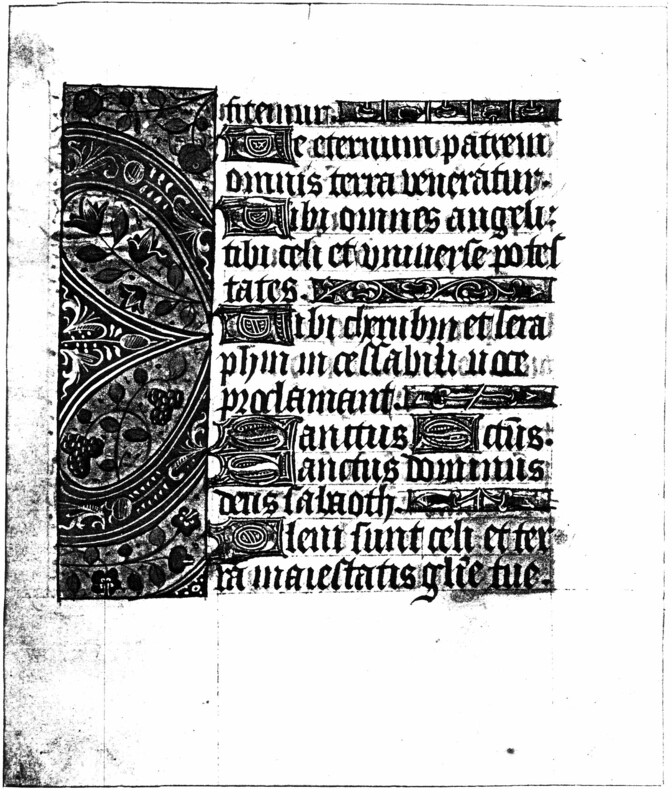 A scan of the recto is not currently available. Tibi omnes Angeli tibi caeli, et universae potestates. Tibi Cherubim et Seraphim: incessabili voce proclamant. Sanctus. Sanctus. Sanctus Dominus Deus Sabaoth. Pleni sunt celi et terra: maiestatis gloriae tuae. we confess thee. Thee the everlasting father: all the earth doth worship. To thee all angels: to thee the heavens, and universal powers. To thee Cherubim, and Seraphim: do cry out with incessant voice. Holy, holy, holy: Lord God of Sabaoth. Full are the heavens, and the earth: of the majesty of thy glory.